In the heart of West Hollywood there is a building on the corner of Santa Monica Blvd. and Larrabee that was the First National Bank in the 1920s. It embodies the Italian style of architecture with its large arched windows and detailed molding. In the late 60s, the inside of the building was transformed into the Larrabee Sound studios. Prince, Donna Summers and Cher were a few of the talented artists who recorded their music at this location. Years ago the lovely windows were blacked and the building sat forlorn and empty until Richard Grossi discovered its beauty. Having great success in opening boutique fitness facilities; Easton Gym on Beverly and Easton Gym in Santa Monica, Grossi had some extra time for a new project and decided to turn the abandoned building into a fine dining restaurant/night club. As the restaurant designer, Grossi kept the integrity of the building and brought back its allure and pizzazz by giving it a three million dollar facelift. He improved the building’s historic features and brought it back to its glory days. Walking into District Grill on a Saturday night I excitedly felt the lively vibe as Top 40 music was pulsating in the background. Even though it was 8 p.m., the restaurant was slowly transforming into the Eleven nightclub from 10 p.m. to 2 a.m. The downstairs bar was filled with locals enjoying beers on draft and colorful libations while watching the latest football game. We were whisked upstairs to a comfortable table overlooking the bar and entrance. Another spectacular bar upstairs offered a blazing fireplace, lounge area and pool table. He attracts new and repeat diners with weekly special events. Monday nights is Broadway musical night with a DJ playing and mixing music to video clips of various Broadway shows. Since live theater is dark on Mondays, many of the talented stars from the latest Pantages musical visit and perform upstairs. There is no cover charge and the evening attracts quite a large theater-loving crowd. Wednesday night is Triple 5, with a $5 appetizer menu, $5 off entrée items and $5 off District Martini’s. Saturday evenings offer stimulating music and dancing provided by Tiger Heat from 10 p.m. to 2 a.m.
We tried a few of the appetizers while tapping to the latest beat from the Black-eyed Peas and Rhianna. The menu is filled with comfort foods, such as the mini grilled Swiss-cheese and tomato triangles with a crisp pickle on top and a trio of tacos topped with pickled onions and cilantro. 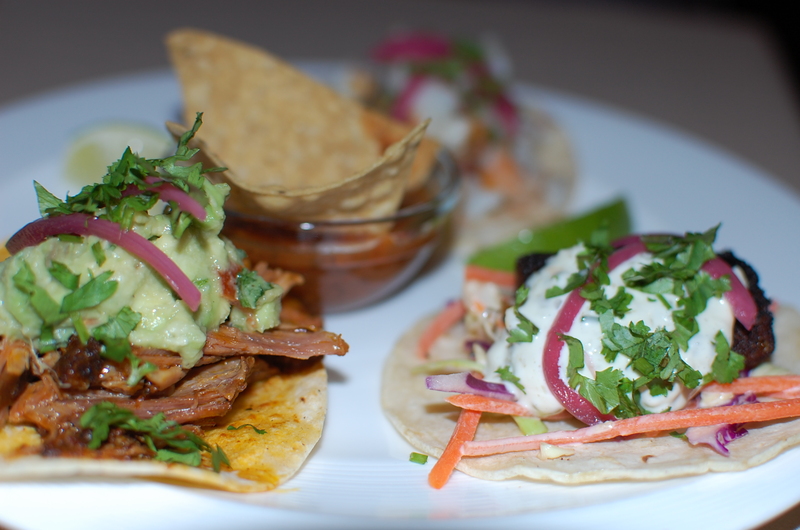 The warm and soft corn tortillas arrived with a tasty carnitas, shrimp and blackened fish with shredded carrots and red cabbage. My favorite was the blue cheese stuffed into a date and wrapped around smoked bacon. This bite size appetizer burst with flavor. 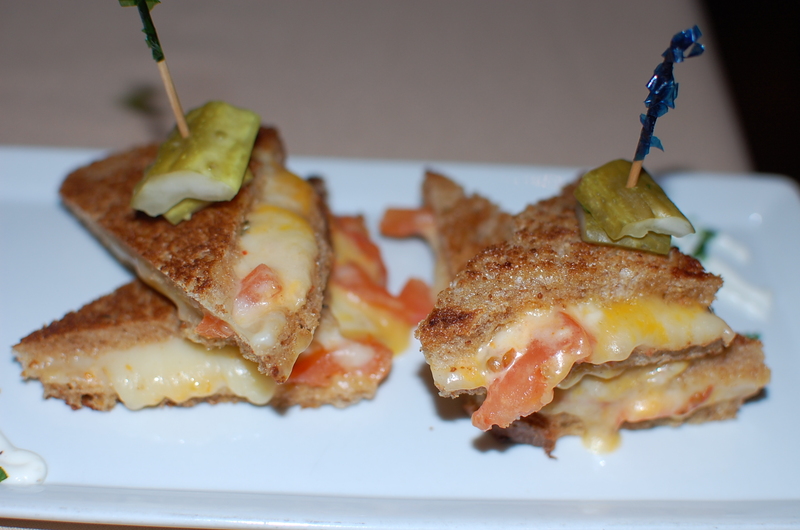 My husband enjoyed the vodka-cured salmon with a hint of citrus on golden raisin bread. Nearby, guests ordered the spicy Tuna Tartar with finely sliced tuna, sesame seeds, avocado, cucumber and ginger rice. For our entrée, we ordered the tender Chicken Marsala with fresh mushrooms served on a bed of confetti-mashed potatoes with flecks of carrots and leeks, giving the dish a festive look. The marsala sauce offered a hint of sweetness. My husband ordered the grilled petite fillet with a port wine sauce. The tender meat was steak-house quality and a great value at $18.95. To finish the evening we ordered a dessert trio. 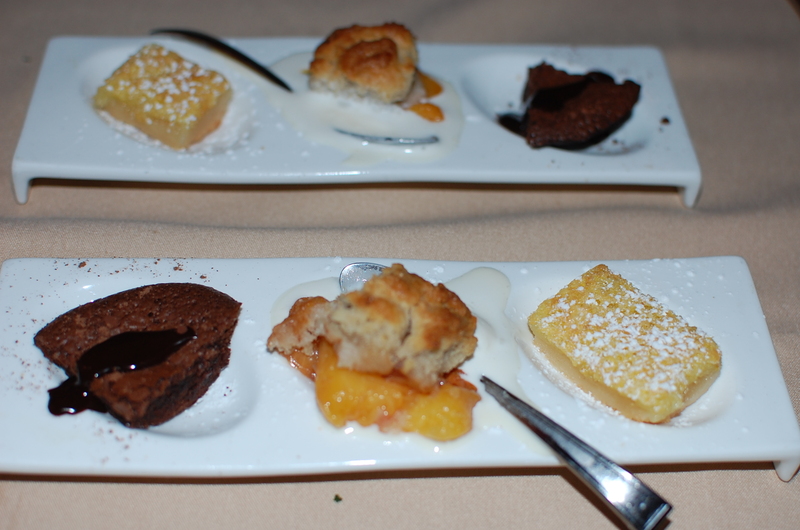 It arrived on a plate with a bite size dense flourless chocolate cake, a slightly tart lemon bar and a petite peach cobbler. It was a sweet ending to an enjoyable and entertaining evening. Price: $ Entrees range from $12.50 to $18.95. 8811 Santa Monica Blvd. (310)855-0800.